Certain games are just part of the landscape in the world of casino gaming. In other words, a casino simply could not operate without providing particular games due to their enormous popularity. 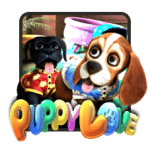 In truth, a casino – brick and mortar or online – could not be taken seriously at all if these particular games were missing. Such games include blackjack, slots, video poker, baccarat, roulette, and, of course, craps. To the uninitiated, craps is “that dice game” that breeds a lot of excitement around the table. Large crowds surround a table when its hot. Honestly, you may see a ton of people playing even when the action is somewhat slow. Why is this? There are a few reasons why craps is so hugely popular. What is the top reason? You can win a lot of money at craps. 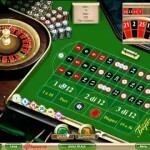 Craps has a long and rich history in casino gaming. If you watch an old movie from many decades ago, you just might see people playing a black and white film version of the game. The rules have not changed much over the years. Why change a game that is, basically, perfected? First, let’s look at a little history. Craps originally started out as a game called “hazard”, a game with origins dating back to the middle ages. Eventually, the rules of the game were tweaked over the centuries until a variation of it found its way to 19th century New Orleans. The modern version of craps is born of that era and locale. So, what is it about this game that has allowed craps to stay so popular through so many years? The rules of the game are very simple to play. 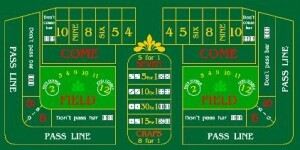 Thanks to the simplicity of the rules, craps becomes very inclusive. In other words, even those who are new to gaming can jump in and play the game. Unlike, say, blackjack or poker, learning complicated rules is not necessary. 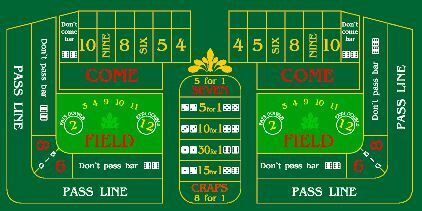 In craps, a shooter rolls the dice on the table. Whatever the outcome of the roll of the dice, there will be winners and losers based on what people have wagered on the table. The shooter makes an initial roll that presents a specific amount. Bets are made on the Pass Line and the No Pass Line. The process starts with the shooter making an initial “Come Out roll” with sets up the point. A point cannot be a 2, 3, 7, 11, or 12. When a 7 or 11 comes out prior to the shooter setting up the point, pass line bets are winners. If any of the other three numbers come up, then the no pass line bets win. That means a 2,3, or 12 is a loss for a pass line bet and a winner for a no pass line bet. Come out rolls employ rolling until the point is achieved – this would be the number 4, 5, 6, 8, 9, or 10. The goal is for the shooter to match that same point again prior to crapping out, rolling the 2, 3, or 12. Once the shooter craps out or makes point, the time comes for another shooter. This is achieved by rotating to the next person around the table. When a shooter is hot and avoids crapping out for an extended period of time, people just might be able to win big through putting their bets on the various other wagers possible on the craps table. A field bet is one such wager that can be made and the bet is performed at any time the dice are rolled. Wagers on 3, 4, 9, 10, or 11 pay 1:1, which means a $2 bet pays $2. A $2 bet on 2 pays $4 as this is a 2:1 bet. With 12, the big payoff is 3:1 so that $2 bet yields $6. Place bets are also wagered and they are, essentially, wagers on specific point numbers with the hope they come up before the shooter rolls a 7. The payouts on these wagers depend on the number and the odds of achieving it. The highest risk bet is also the highest paying one. This would be a proposition bet, which is a wager placed on a single number for a single roll. If the number comes up, you win. A 7 pays 5:1, an 11 pays 16:1, an ace/deuce (one and two) pays 16:1, two aces (ones) and a 12 both pay an astounding 31:1. Again, while these bets are risky, the risk is worth it to many since the payout could be huge. Again, this is a pretty easy to learn game. The minute you get the hang of how to play, the whole process of playing is exciting. Just be sure not to allow the excitement to make your wagers reckless and risky. Granted, during a hot game when the shooter is doing good for all the players, big wins are a possibility. 1.) The house has the edge as far as the odds are concerned. This is not exclusive to craps. The house has the edge in all the games offered in a casino. That is to say, the chances always favor the house over the player when it comes to winning. 2.) Take the necessary time out to learn the rules. 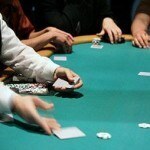 While craps is a simple game to play, there are certain rules that determine the outcome of the game. Assuming you understand the rules and the payouts could prove both confusing and problematic. The outcomes are going to be based on the rules as written and not on your understanding of them. Invest a little time learning the rules and you should have no problems making smart and informed wagers. You also won’t be lost during game play. 3.) Play follow the leader when someone is successful. Look at what other players are doing and if they are winning. Try to mimic the success of those who clearly are doing pretty good with their wagers and decisions. Following the lead of someone on a hot streak just might deliver your own hot streak. Always play responsible when wagering at craps or, for that matter, any other casino game. Set a certain limit on the amount of money you are able to lose without missing and stick to that figure. Once the money is gone, quit playing. Following such simple advice makes playing craps a lot more enjoyable and fun. Plus, you boost your chances of winning.